Endoscopic sleeve gastroplasty (ESG) sustains loss of total body weight for up to 24 months, and also reduces markers of hypertension, diabetes, and hypertriglyceridemia, researchers report from a prospective study published in the April issue of Clinical Gastroenterology and Hepatology. ESG is an incisionless, minimally invasive bariatric procedure that reduces the length and width of the gastric cavity to facilitate weight loss. In a previous clinical trial, ESG was found to delay gastric emptying, induce early satiation, and significantly reduce body weight. Reem Z. Sharaiha et al performed a prospective study to evaluate the effects of ESG on total body weight loss and obesity-related comorbidities. They collected data from 91 consecutive patients (mean age, 44 years) undergoing ESG. All patients had a body mass index (BMI) greater than 30 kg/m2 and had not lost weight with previous strategies, or had a BMI greater than 40 kg/m2 and were not candidates for surgery (or refused surgery). Before ESG, 10% of patients were taking lorcaserin, phentermine-topiramate, or phentermine alone. Eighteen patients (19.8%) had type 2 diabetes mellitus at baseline (with 13 patients on medications), and 15 patients (16.5%) were prediabetic. Eighteen patients were diagnosed with hypertension and were on anti-hypertensive medications, and 13 patients had dyslipidemia and were taking cholesterol-lowering drugs. The ESG procedures were performed with a cap-based flexible endoscopic suturing system to facilitate a triangular pattern of sutures to imbricate the greater curvature of the stomach. The patients’ mean BMI before the procedure was 40.7 ± 7.0 kg/m2. Patients were evaluated after 6 months, 12 months, and 24 months for anthropometric features (BMI, weight, waist circumference, blood pressure) and underwent serologic (hemoglobin A1c), lipid panel, serum triglycerides, and liver function tests. 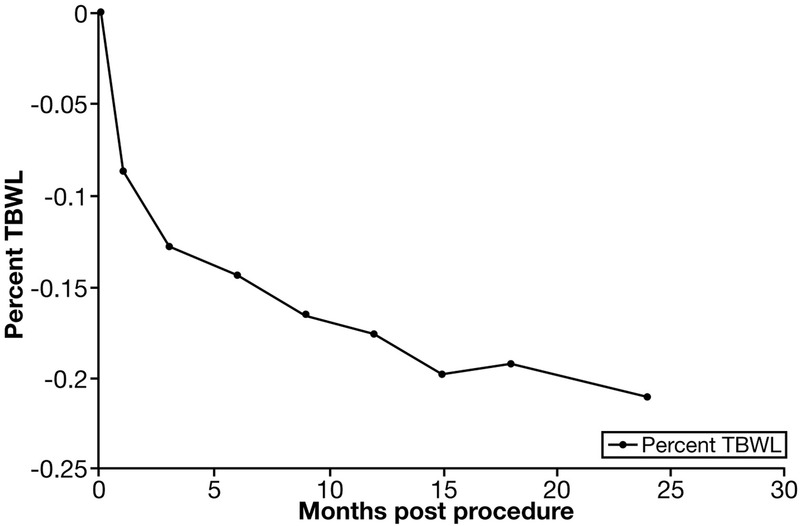 At 6 months after the procedure, the patients’ mean total body weight loss was 14.4%. Mean total body weight loss values were 17.6% at 12 months and 20.9% at 24 months after ESG (see figure). At 12 months after ESG, patients had statistically significant reductions in levels of hemoglobin A1c, systolic blood pressure, waist circumference, alanine aminotransferase, and serum triglycerides. Five patients could stop taking insulin and 2 patients stopped taking all medications. However, there was no significant change in low-density lipoprotein after vs before ESG. There was 1 serious adverse event (a perigastric leak), which was managed non-operatively. Sharaiha et al reported restriction and decreases of stomach volume after ESG. In univariate analysis, younger age was significantly associated with weight loss at 12 months. The authors propose this was because of the social impact of obesity at a younger age and the ability of younger patients to change their eating habits. These findings indicate that obese patients have the motivation and ability to change their eating habits. Sharaiha et al suggest that older patients may need dedicated nutritional programs and individualized post-procedure care. There was no statistically significant effect of the suture number (in both the first and second layers), change in stomach size, total number of sutures, and diabetic status on percent total body weight loss at 12 months. The authors conclude that this is the largest series of patients to date who underwent ESG and achieved significant weight loss. Importantly, in addition to weight loss, Sharaiha et al observed significant improvements in almost all measures of obesity-associated comorbidities. Because of the growing obesity epidemic and the rising cost of health care in the United States, there is increased demand for less invasive bariatric therapies. ESG is a same day, outpatient endoscopic procedure with significant effects on weight loss and a low rate of adverse events. Long-term studies are still needed, but ESG appears to provide a promising approach to weight-loss therapy.